Christmas from 1963 through 1969, The Official Beatles Fan Club sent free 7 inch Christmas records to their fan club members, which contained skits, messages and brief songs which were otherwise unavailable. 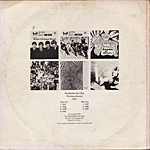 The disks were flexi's made by the Lyntone company, and each of them came in special picture sleeve. These special records were never available for sale in stores. 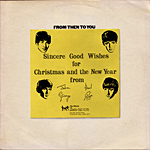 At the end of 1963, the Fan Club was unprepared for the tons of extra subscriptions it received, so in addition to the multiple thousands of Christmas disks it mailed out in December, they also made a complete extra run of the flexi-disks without the sleeves (to save time), mailing them out early February 1964 with a letter of apology and an explanation from the Club. 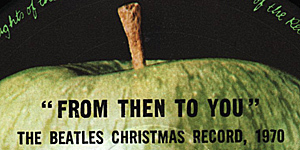 The total of 1963 Christmas disks made, both with and without sleeves, was just over 30,000 copies. Go to Compilation "The Others"
Notice* Click the label of each album, so you can see the large picture image. 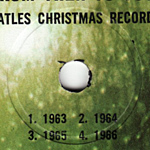 The front cover is a white background with the LP title written in black above the 1963 UK X'mas flexi front cover. The back cover have the remaining six front covers of the flexis. 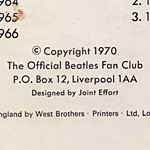 On the back cover, The Official Beatles Fan Club address and designer's name were printed. On the back cover, printer's name "West Brothers" was printed. 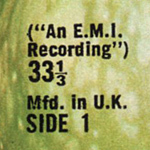 Label have "An E.M.I. Recording" text on two lines and small "33 1/3"
On December 18 1970, The Beatles Fan Club still existed although the Beatles had officially announced the break up of the band earlier in the year. Since recording activity had halted for the group as a collective unit, there would be no chance of a new Christmas flexi being prepared. 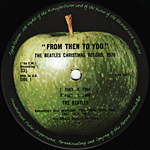 Therefore, The Beatles Fan Club released a 12 inch vinyl compilation mailed out to it's members entitled "From Then To You" in LP form. The catalogue number for this LP is LYN 2153/54. 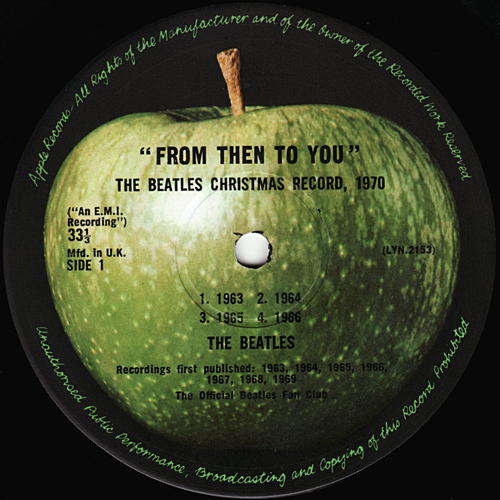 "From Then To You" was only released in the United Kingdom. The front cover consists of a white background with the LP title written in black above a the 1963 UK Christmas flexi front cover. 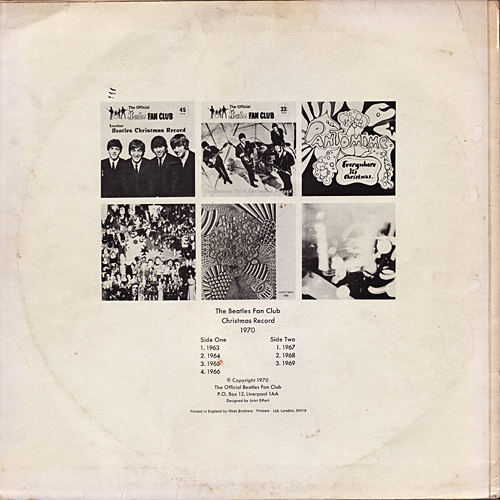 The back of the cover is also a white background with the remaining six front covers of the Fan Club Christmas flexis in black and white. 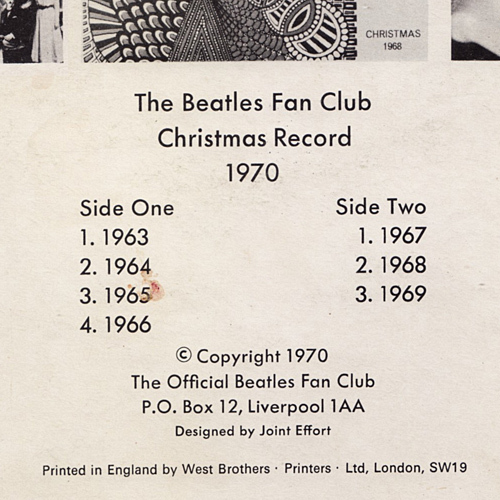 Under the photos of the covers are the words: "The Beatles Fan Club Christmas Record 1970". 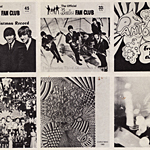 A copyright 1970 statement follows and the Beatles Fan Club Liverpool address is used. 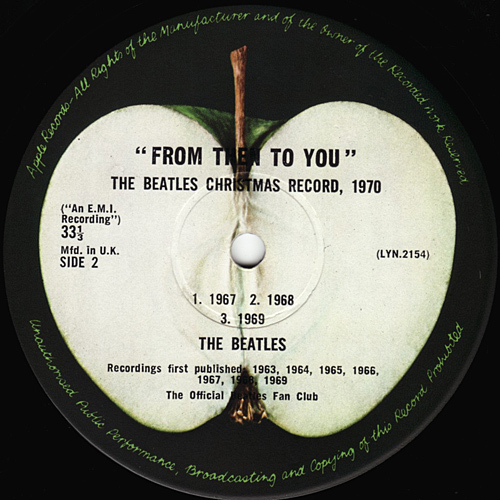 The records were housed in standard white paper EMI or Apple Records inner sleeves.